Too used to being connected all the time to the internet, we got ourselves a DTAC Happy Tourist 3G prepaid SIM card the first thing we got out of immigration. We chose the DTAC Happy Tourist 299 Baht option that came with 100 Baht worth of free calls, which is suitable for short stay visitors to Thailand. More importantly, it came bundled with free 7-day unlimited internet access! Getting a Thailand prepaid SIM card is really cheap here, and it would be a waste not to get it. 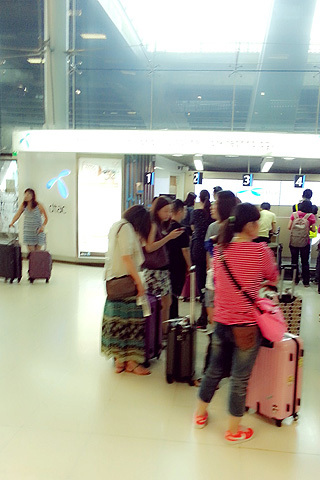 To get your Thailand prepaid 3G SIM card, heard to Gate 7 on arrival. Located at Arrival Hall, 2nd Floor, Gate 7, the DTAC service centre can be easily located. Judging from the endless queue of people who are purchasing their prepaid 3G SIM cards and the huge signage, you would have no problem finding it. If you missed it, these mobile prepaid cards can be purchased from convenience stores as well. Worried about not speaking a single word of Thai? Fret not. The counter staff speak some English. Besides, all you need to say is : “Happy Tourist. 299 Baht. Micro SIM.” Hand over the money, and you’re done. They have Nano SIM cards for iPhones as well, so please tell them what kind of prepaid mobile SIM card you need. Insert the DTAC Happy Tourist SIM card and wait 5 seconds. Start enjoying your unlimited Internet access! Be sure to test your DTAC SIM card right after purchasing, so that you can exchange it in case it isn’t working properly. DTAC Happy Tourist SIM has great reception in Bangkok, and we didn’t encounter any problems using it throughout out 4D3N Bangkok trip. In fact, it was so reliable I even used it in our hotel room as I was too lazy to sign in to the free wireless network. A common question people ask : Will my Whatsapp still work, now that I have changed my mobile SIM card to DTAC prepaid SIM card? The answer is yes! 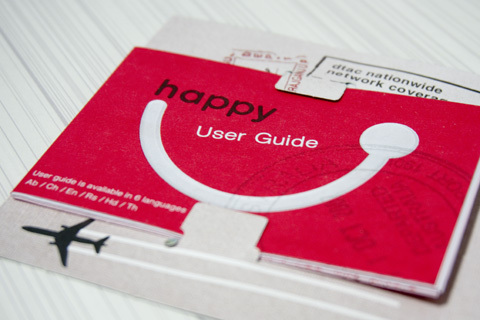 for the happy tourist sim card, is it a micro or a regular sim card? cos my phone uses micro >_< thanks. 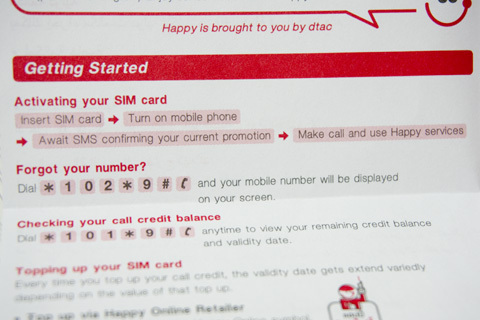 The Happy Tourist SIM Card comes with micro SIM version. Your phone can use it. I got mine on Amazon Prime before my trip, worked great! Insert the DTAC Happy Tourist SIM card and wait 5 seconds. Start enjoying your “limited Internet access”! Be sure to test your DTAC SIM card right after purchasing, so that you can exchange it in case it isn’t working properly. Should it be “unlimited” instead? Enjoy your Thailand trip – stay safe! Thanks for pointing out the typo error, I’ve got it corrected.